The terminal accepts paging requests via direct dial-up phone interface or via data entry equipment. It is connected to the controller for key request,control handshakes, and to pass on pager addresses and information for transmission. Terminals maintain subscriber data and can provide paging traffic and billing data. The controller is responsible for recognizing paging requests from the terminal and for keying the transmitters in the proper paging mode, analog or binary. Advanced controllers also report system alarms, perform system maintenance, store transmitter data, monitor transmitter performance, and log transmitter station alarms. 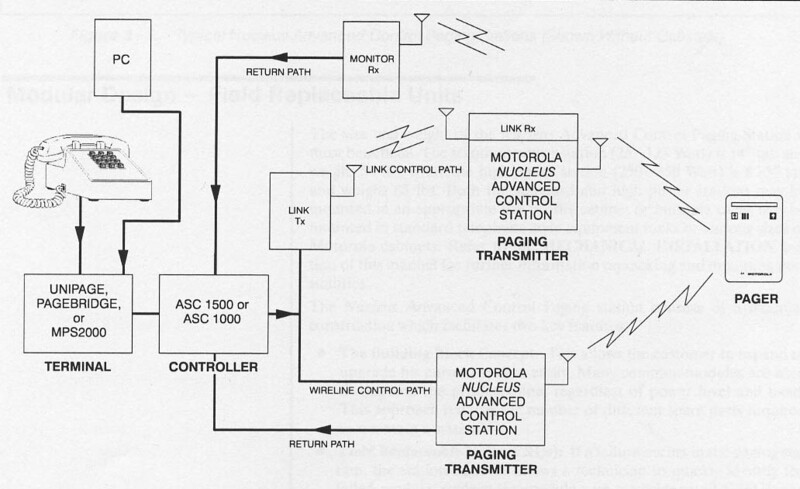 The paging transmitter decode key requests from the controller, and (with the antennas) convert the paging information from the terminal into modulation and RF energy for transmission to the pager. Transmitters continually check their operating perfomance and generate alarm if needed. The control path from the controller to the transmitter can be a RF link, a privet leased line, or a satellite link. The return path can be a privet leased line, over-the-air to a monitor receiver, or modem-to-modem. The pager is a miniature radio receiver carried by the user for retrieval of information from the paging terminal. Pagers can provide the user with an alert, a voice transmission, a numeric display, or an alphanumeric display.